and tend reclamation in Israel. JNF's Tree of Life Award. the NCCJ office at 749-4454.
ations in a one-week period. killing or injuring a Palestinian. served while awaiting the trial. will put an end to Israel." man now claim was achieved. SEE FOR YOURSELF. SEE ISRAEL. an ally in armed might. views and a screened balcony or patio. Some also feature bay windows. assisted living is also available. come and see for yourself how the beauty unfolds at Hamilton House. ing of science and technology. and North Miami Beach areas. to few foreigners. Also elected as a Fellow at the same time was Princess Diana, seated at left. tastes great, its tow in cholesterol. be given by Dr. Max Bree. day and life cycle observances. from 8-9 a.m. and 4-6 p.m. Zoo on Dec. 28, movies on Dec.
Chocolate Lady on Jan 2. Am in Miami on Friday, January 6. EVERYONE is invited to worship with us on this special evening. precede the service at a cost of $10.00, per person, at 6 PM, as well as a special Oneg at the end. Please call the above Miami number for dinner reservaitons. Shabbos dinner and Maxwell House Coffee. delicious taste of Maxwell House* Coffee. Maxwell House* Coffee. Always... Good to the Last Drop! Tuesday as the next U.S.
be members of the Cabinet. at the embassy in Israel. was very popular with Israelis. their names into the Torah. United States remains open to question. Jewish, Armenian or any other nationality. women read from the Torah at the Kotel. helped the people Israel remain one. role vis-a-vis Israel as the late Harry S.
passed by any of his predecessors. address the UN on the Palestine question. not be cowed by convention. and are awarded solely on the basis of merit. Jewisk Florida* Dm* Not GuraaUc Kaakrata of MerckaiKtiM AdrvrtWd. Southern Bell provides services within your calling zone and a connection to other long distance companies. vices will be held Friday, Dec.
will participate in the services. nie Neuringer, daughter of Dr.
was celebrated on Dec. 10.
gion, national origin or creed. ple Beth Israel of Sunrise. will be held Wednesday, Jan.
cholesterol in their diet anyway? Nobody. Mazola. Use it and be well. 179 of whom went to Israel. ed for far greater duration. Soviet Union, in Israel and in the Diaspora. 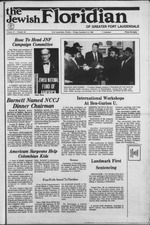 through the promotion of Jewish education. the matter to the courts. /Ja <" Aflad at Douglas Gardens. quently refused to indict him. By then it was March 1986.
away. Because we know nothing's better tor your body. the good of the country. military service given to yeshiva students. an integral part of the security forces. old Jewish cemetery on the Mount of Olives after dark. There has been a rash of vandalism at the cemetery. J RESERVE FOR CHRISTMAS OR NEW YEAR'S "SPALIDAY"! & Nitely Dinner Dancing & Entertainment! Perperson in a double room. i 53 per single room. xtra* or required add on*. Big n Crusty' Bagel, the bagel that's plump. pnanca wnn LI Kiwi lAJUpon nauampaon roncy. 1 Bakary. CMS Oapt #21000, i Fawoatt Dr.
prayer shawls traditionally worn only by Jewish men. pray regularly at the holy site. trying to recruit like-minded persons in Switzerland. hundreds, asking them to join the movement. whom she has good relations. * H II ? ? Bakeries Only, Beautifully Decorated. Wreath. December 24. 1988. Quantity Rights reserved. Only in Dade. Broward. Palm Beach. Martin. St. Lucie. Indian River and Okeechobec Counties. morning, 9:00 a.m. RahM William Marder. Cantor Yehuda Heilbraaa. TAMARAC JEWISH CENTER (721-7660). 9101 NW 57th St., Tamarac 83321. Friday service 8 p.m. RahM Kart F. Stoat. a.m., Jr. Cong. 10 a m Rabbi Avrahaai Kapnek. Caator Eric Liadenbaan. a.m., 5 p.m.; Sunday 8:30 a.m., 6 p.m. Rabbi Paal Plotkia. Rabbi Eawritas, Dr.
Solomon Geld. Caator Irving Grossman. TEMPLE BETH ISRAEL (742-4040), 7100 W. Oakland Park Blvd., Sunrise, 33813. Blvd., Deerfield Beach 33441. Services: Sunday through Friday 8:30 a.m., 6 p.m.
Presler. Caator Barry Black, Cantor Emeritaa Jack Marchaat. Friday evening at 8. Saturday and Sunday 9 a.m. Dr. N. Saul Goldman, Rabbi. service 8 p.m. Saturday 8:46 a.m.; 5 p.m. Rabbi Avrom Draxin. Caator Joel Cohen. 8:45 a.m. Rabbi Israel Hainan. Sunday to Friday at 7:46 a.m. Friday at 5 p.m.; Saturday at 8:46 a.m. Charles B.
Friday 7 a.m. Saturday 9 a-m., Sunday 8 a.m. Rabbi Yoasie Denbarg. 8 am., 5 p.m., Saturday 8:46 a.m., 6 p.m.
SYNAGOGUE OF INVERRARY CHABAD (748-1777), 4561 N. University Dr..
Women. Tuesdays 8 p.m. Rabbi Aron Lieberasaa. Deerfield Beach 33441. Services: Sunday through Friday 8 a.m. and 6:30 p.m.
Saturday 8:45 a.m. and sundown: Joseph M. Reiner, President. sundown; Saturday, 7:15 & 9 a.m., & sundown; Sunday 8 a.m. & sundown. 33321. Services: Daily 8 a.m., mlhAa 5 p.m.; Saturday H:4fca-sv and-6J6 p.m.
RAMAT SHALOM (472-3600), 11301 W. Broward Blvd.. PlanUtion 33325. Steven Perry. Caator Ron Graner. TEMPLE BETH ORR (763-3232), 2151 Riverside Dr., Coral Springs 33065. Services: Friday 8 p.m. except last Friday of month at 7:30 p.m.; Saturday 10 a.m.
Menorah Chapels, 2306 W. Hillsboro Blvd., Deerfield Beach 33441, Friday 8 p.m. Rabbi Altoa M. Water. Cantor Mo.be Lsvinooa. TEMPLE EMANU-EL (781-2810), 8246 W. Oakland Park Blvd., Greater Ft.
Coconut Creek Parkway 33066. Rabbi Brace S. Warshal. Cantor Jacob Barkin. TEMPLE BAT YAM (928-0410), 6151 NE 14th Terr., Ft. Lauderdale 33334. Service: Friday 8 p.m. Saturday 10:30 a.m. Rabbi Lewis Littman. Morris, a resident of Sunrise, died Dec 8. Dec. 6. A former resident of Lido Beach. Honor Society, is on the "A"
Claire Mautner of Boca Raton. her Bat Mitzvah Friday, Dec.
Beth Torah, Tamarac, on Dec.
Deutch of Forest Hills, N.Y.
sion of his Bar Mitzvah. Broward, Dado and Palm Beach counties"